Students chose the cougar as their mascot, but some parents complained about the term's use in regard to women. It's tough to pick a mascot these days. Over the past few years we've seen several instances of schools being pressured to change their mascots because of cultural sensitives like Miami University of Ohio having to go through a 25-year process to change from the Redskins to the Redhawks. But we've never heard of a mascot that offended, well, older women. The Corner Canyon High School in Draper, Utah, needed to choose a mascot and after 23% of students who voted decided they wanted to be the Corner Canyon Cougars. Falcons, Raptors and Diamondbacks were the other choices on the ballot. But that didn't sit well with parents who called in and complained that "Cougar" was a derogatory word because of how it's made its way into our vocabulary for older women who like to date younger men. "We have received numerous e-mail messages and phone calls from parents and patrons in Draper asking us to reconsider the inclusion of 'Cougars' as a mascot option," David S. Doty, superintendent of the Canyons School District, wrote in a memo to the Board of Education. "Opposition to the 'Cougars' focuses on a concern that the mascot, combined with the school’s blue/white/silver color scheme, will be too similar to Brigham Young University. Many also have commented on the negative double entendre of the word 'cougar.'" A cougar mascot doesn't seem to present a problem at well-known Brigham Young, in Provo, where 19 varsity teams, including 10 women's teams, compete under the Cougar nickname. But down the road in Draper, the school board scrapped "Cougars" from the list of mascots and settled on the Chargers. Maybe in Draper the ABC sitcom "Cougar Town," starring Courtney Cox, didn't go over real well. For reference, because we know you were curious, we dug up a few statistics for you. - Draper, Utah has a total population of 42,274 people. –There were 12,685 people age 35 to 54. The median age there is 30.7. –There are 5,709 women ages 35-54. 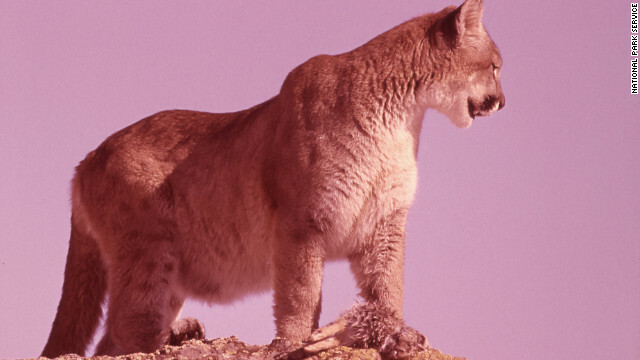 –There are roughly 3,000 total mountain lions in the state of Utah "plus or minus 1,000." - But it’s tough to get a true estimate. “The elusive nature of the big cats, compounded by their penchant for nocturnal activities, makes them difficult to count,” Kevin Bunnell, mammals coordinator for the DWR, told the Salt Lake Tribune. While no doubt everyone has their own view on the matter of picking mascots and what is politically correct, it seems like the list of things you can't call your team continues to grow. And you never know, this story may not be over yet. "Chargers" may be deemed offensive to people who are up to their necks in credit-card debt. What do you think? Was the decision to scrap the mascot a legitimate one, or is this a case of people being slightly oversensitive? Gosh, I missed this situation while I was out working my flower beds with my "hoes." It's gonna be "gay" in the spring when the blooms are open. I wonder, has this town banned the use of the words "dog" "wolf" "tiger" "snake" in their community because some people may use these words to to describe predatory men? NO! And why not? Because most of the people are able to tell the difference. These kids chose the word Cougar because it represents a strong, powerful, cunning beast that wins the game of life by surviving/heading up their part of the food chain.! Not because they all desire to be like sad older women who "prey" on younger men who willing to pander to their insecurities for personal gain. I'm a cougar and I wouldn't be one bit offended by it!!! Ok everyone who is on this I hate Obama train can get off at the next stop. The man needed the last 3 years to try and clean up from our "lovely" bush years and he needs the next 4 to make any real change. Obama is not the cause of all the problems in America! stop blaming the black guy. Progress is a slow process... What does Obama have to do with some school in Utah anyway? Maybe they should've called themselves "Queens of the Stone Age" instead.